With new technologies, sometimes there are risks. However, without taking risks, it is almost impossible to accomplish new things. This is definitely the case with APIs. This emerging technology is exploding in popularity because it builds on well-understood techniques and leverages some existing infrastructure. 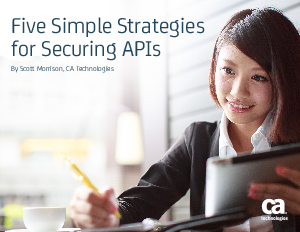 Download this whitepaper to learn five simple strategies for securing APIs to avoid risks and see why it is truly an emerging technology that will benefit the future of your organization.